Very pregnant Pumpkin just didn’t realize the size of her belly when she crawled under a shed in the backyard of the Rogersville, Tennessee Hawkins County Humane Society on Wednesday for a short morning nap. “She was pitiful, crying and scared. We had to call an expert; he came and saved her. He had to jack up the building to save her. WHAT A HERO!!! Pumpkin thanked him with lots of kisses!!! He also fixed it so it won’t happen again,” the assistant manager of the shelter, Julie Baker posted on the organization’s Facebook page. Everyday, the rescue dogs get to play in the shelter’s fenced in yard. As the dogs were being called inside, Pumpkin was no where to be found. It wasn’t until Julie heard the dog crying that she could follow the pitiful whining. 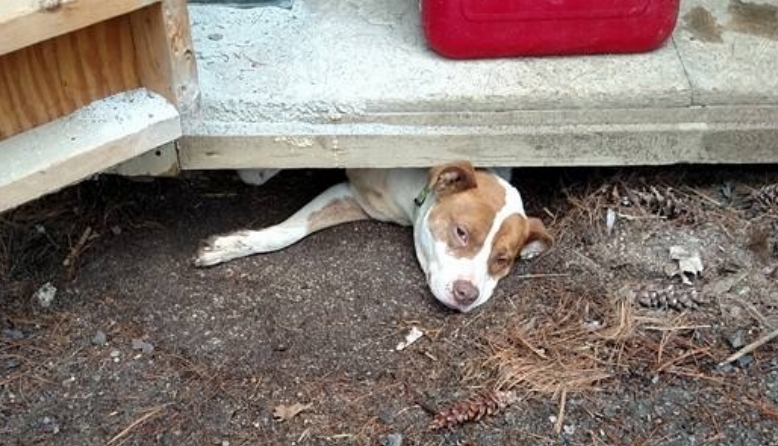 She had crawled under the shed headfirst, turned herself around and then got stuck. Because of the size of her belly, no one on the staff could even wiggle her out. 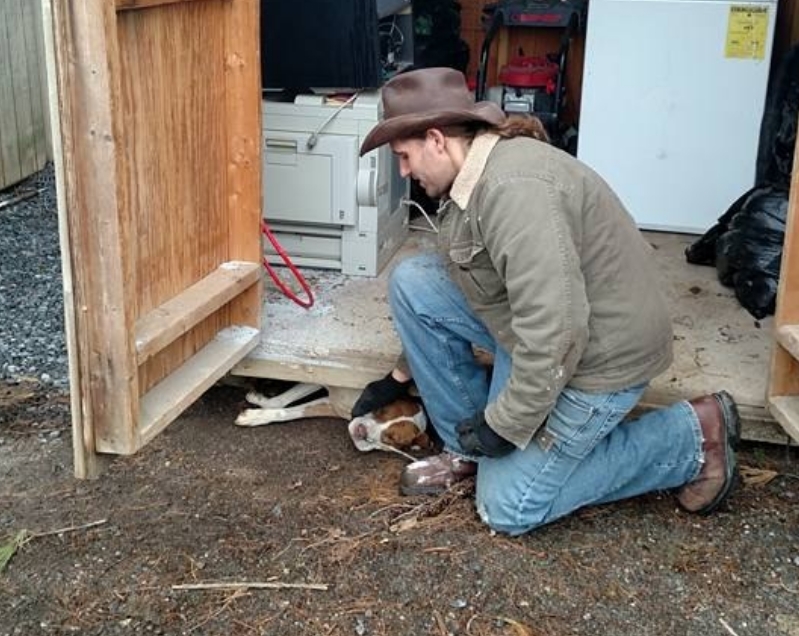 And then came volunteer handyman, Joey Arnold to Pumpkin’s aid, who decided to jack up the shed so the dog’s belly wouldn’t be affected. 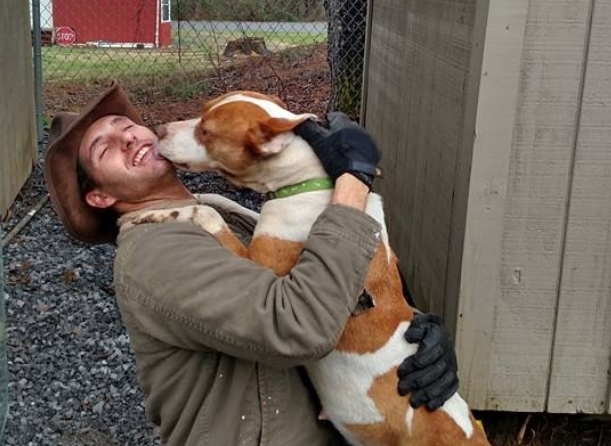 All together, Pumpkin spent an hour trapped, but just like a dog – she waddled right, shook herself off, headed over to Joey with her tail wagging – and planted some nice wet kisses on her rescuer’s face. The three-year-old mixed breed pooch was found as a stray and is eligible for adoption or fostering now or after she gives birth to her puppies. Once the puppies are able to fend for themselves, they can be brought back to the shelter for adoption, if someone wants to just keep Pumpkin. 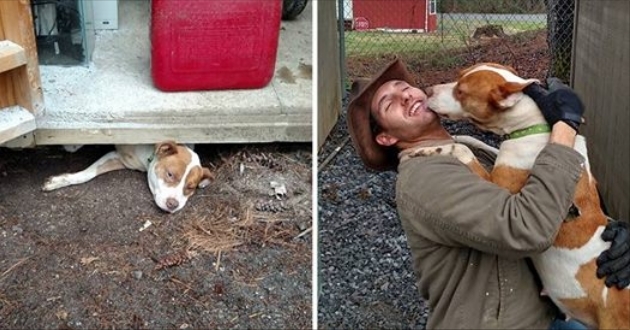 Responses to "Pregnant dog trapped under a shed shows gratitude after her rescue"
You are such a kind man and she sure does appreciate you for what you did. I'm not sure I would have thought to raise the shed like that. Very well done! !